With the appropriate fanfare, and Harry Potter, and Queens dropping out of the sky (clever, that), the London Olympics are underway. For the next two weeks, we will watch, enthralled and only 6 hours behind, as badminton is played and canoes are slalomed, as Phelps cuts through the water and Sharapova serves up victory. As a summer resident of a shore town, I truly believe we could add another layer of excitement to the competition in the future, and hereby nominate Rehoboth Beach, DE as the site for the 2024 Summer Olympics. What would be our contributions to this fabled athletic contest? Try these on for size! July Saturday. EVERYONE ON EARTH is headed south @ 2 PM (cottage check in time). Look for Italy and France to dominate this “Race to Leisure”, as they barrel down the shoulder, ignore posted speed limits and merge at will. One team will arrive, bloodied but intact, at the realtor’s office for the key. Are we recreating yet? Sure, the food is wildly overpriced. Where else does a can of Old Bay Seasoning, a pound of lunch meat and some milk cost over $50? Ouch! But we need to EAT, dammit! And we want to get to the beach before dark! So on your mark, get set, go! China may be the favorite here, combining awesome mastery of crowd logistics with flat-out hunger. There are contraptions with these signs all over town, powered just by people pedaling. I think folks assume it’ll be easy. In reality, these out-of-shape and underprepared drivers can barely make the pedals move, meanwhile halting traffic everywhere they venture. Who can go slowest? Team USA! Proudly sponsored by McDonald’s and Coke! Need I say more? I run in the morning (or try to). Early as I start, I am still challenged by my fellow boardwalk denizens: The Bicycle Family (“Now Jason, don’t hit that nice lady! Oops, Sorry!”), The Chubby Women Who Gossip (and spread out as a phalanx, impossible to pass), The Inexplicable AM Ice Cream Eater (“What? What? I’m on vacation!”) The Americans, I believe, have this one sewn up too. That’s my proposal. 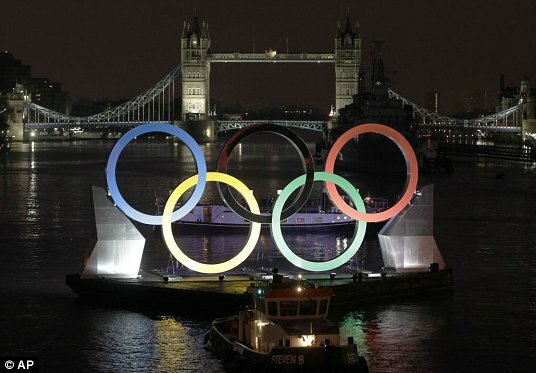 Looking forward to hearing from the IOC. 2024 here we come! What IS that noise? I look out the family room window. A light snow has fallen overnight, and the grass has a fine coating of glistening white. Not what you would call baseball weather. 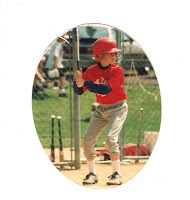 Yet there he is, 11 year old Sheridan, pitching his heart out, the ball hitting the shed door, over and over. Thunk! It’s months until the playing season will begin, but that matters not a whit to Sher. 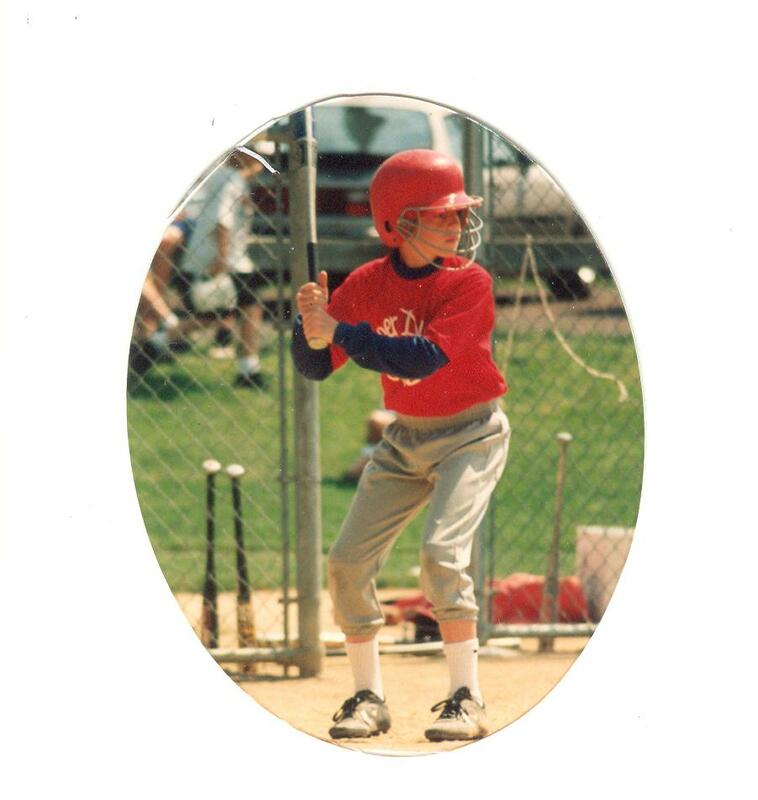 If he’s going to be a pitcher then, by gum, he’s going to practice. Every single day. Rehoboth Beach. Summer of 1996. 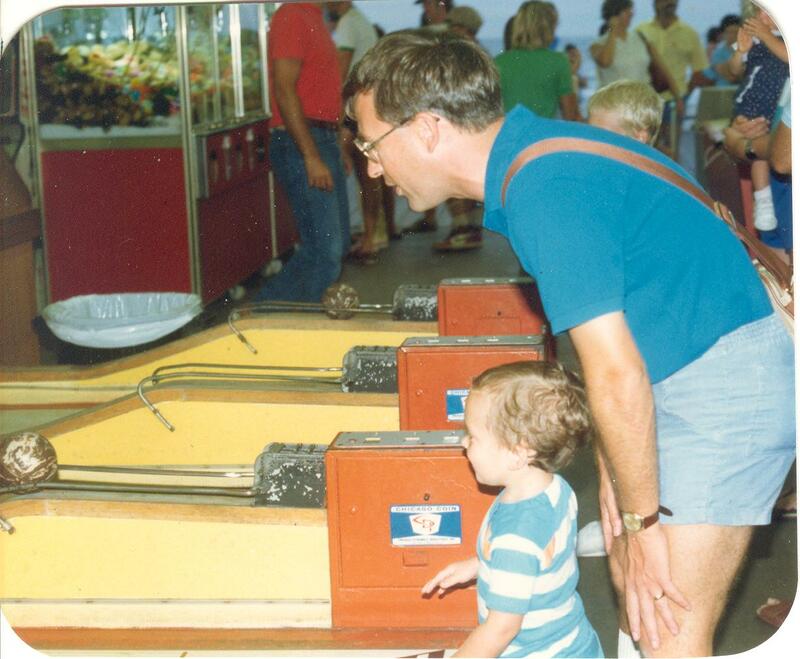 Young teen Sheridan has decided that this is the year he will master skeeball on the boardwalk at Funland. While the rest of us scatter to the merry-go-round, the helicopter ride, the horse-race game, Sheridan exchanges his dollar bills for a pocketful of quarters and heads back to what is, for him, THE contest. Over and over he aims the balls into the rings on the wall. 250 points wins a large stuffed animal. He is years past coveting this prize, and yet he wants to win in the worst way (he’ll later give the stuffed friends to his younger siblings). 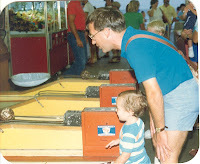 Skeeball Champion Seyfried has one word of advice for all the wannabe winners: practice. Dinner's been eaten and dishes are done. It’s Sunday evening and time to relax, regroup and get ready for the week ahead. But wait—where’s Sheridan? He has collected his music and gone down to church to play the organ. 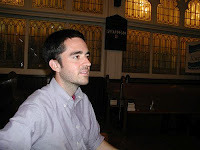 Mind you, he has already logged several hours at the keyboard and pedals today, as organist and music director at Grace Lutheran Church. But it’s not enough—the organ is a very demanding instrument, and Sheridan is determined to play it very well. To that end: practice and more practice. A certain number of things come easily to me, and so, those are the things I do. The rest, I avoid like the plague if at all possible: bicycle riding, parallel parking. Speaking Spanish. Card games. When I hear “practice makes perfect” I shrug, reassure myself that nobody’s perfect, and go back to my fairly unskilled and unfocused life. My lack of self-discipline stands in sharp contrast to my dedicated and hard-working son. When, several years back, Sheridan valiantly attempted to teach me piano, I sabotaged my own efforts by stinting on practice time. Clearly I didn’t, I don’t, want to excel badly enough to put in the required hours. Better to limit myself to what I think are my natural strengths. Better not to try so hard. Sher never, ever criticizes me—he’s far too nice for that. But I’m sure I am an alien species to him, someone who is unwilling to practice, even when practice would lead to success. I’m grateful for his patience with his lazy mom. Maybe someday I’ll be inspired as well, and learn something new the hard way—with practice. Meanwhile I settle. I settle when, like Sheridan, I could soar. I am not an ad-libber in the kitchen. Far from it. I think it's great that some people (including a few related to me) can open the fridge and pantry and make culinary magic happen with a can of anchovies, a jar of mustard and a cantaloupe. I am recipe-bound and probably always will be. As Seinfeld would add, "Not that there's anything wrong with that!" I just feel more secure following in the footsteps (by steps by steps) of another chef when mealtime rolls around. Julia Child, James Beard, Marcella Hazan--I love 'em all, and credit them with some of my favorite dishes. No dessert, in my opinion, tops Julia's chocolate mousse; Jim's oatmeal bread is to die for; Marcella offers a bit of heaven on a plate featuring veal, asparagus and fontina cheese. Why attempt to improve on perfection? I guess part of me hesitates to experiment because I tend not to trust my instincts in general. I torture myself over everything I've said and done each day (stupid! hurtful! thoughtless!) and wish there was a "Life for Dummies" manual I could purchase. But in the world of food there ARE primers, and if you follow directions, lo and behold, you can achieve success. From time to time I check out food blogs (Smitten Kitchen is a popular site), but I much prefer using my old-fashioned, grease-spattered cookbooks to lugging the laptop into the cooking area. I still use Child et al, but I have become a rabid fan of Rachael Ray. This confession inspires strong emotion among my friends. You either love Ray or you hate her, I've discovered. Some find her on-screen persona annoyingly perky (I don't watch much TV so rarely catch her show). She does use quite a few buzzwords and phrases, I admit, and some of them are a little too cutesy-pie (yum-o, and EVOO--extra virgin olive oil--spring to mind). But let me tell you, the woman can cook! I now own 6 of her books and have never hit a clunker...everything turns out great. Rachael is fearless when it comes to seasoning. I gulp, but obey, when she calls for 8 garlic cloves, or 1/2 cup of hot sauce, in a single recipe. She enjoys putting odd ingredients together (Thai Chicken Pizza, Philly Cheesesteak Mac and Cheese), and pulls everything off with confidence. As a result, I can follow her lead and feel kitchen-confident as well. 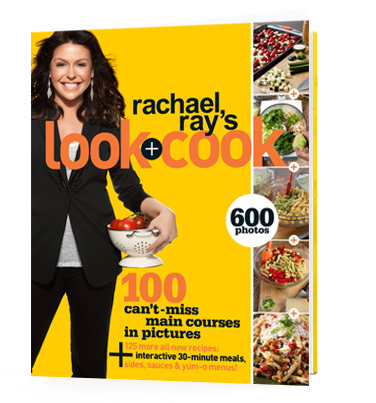 On the page, at least, Rachael Ray exudes good humor and boundless enthusiasm for food, and life. I envy her that. What am I boundlessly enthusiastic about these days? I honestly don’t know. I do know I’m exhausted, so maybe I should give myself a break when I’m not leaping for joy every moment. It’s overcast this afternoon, and gloomy. I’ve been writing a new essay, and it’s not going very well so far. It would be great to feel successful about something today. I know! 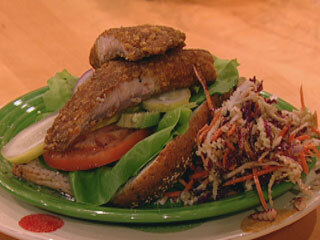 Tilapia Sammies with Honey-Citrus Slaw! Growing up, we lived in a section of Manhattan called Stuyvesant Town. During the summer, we children slept on the apartment floor with box fans aimed at our bodies, and still we sweltered. In lieu of hydrant-opening, Stuyvesant Town had giant sprinklers resembling shower heads that we could run under (and run we did) on the hottest days. Lenz’s Deli was a brief refuge from the boiling temps. 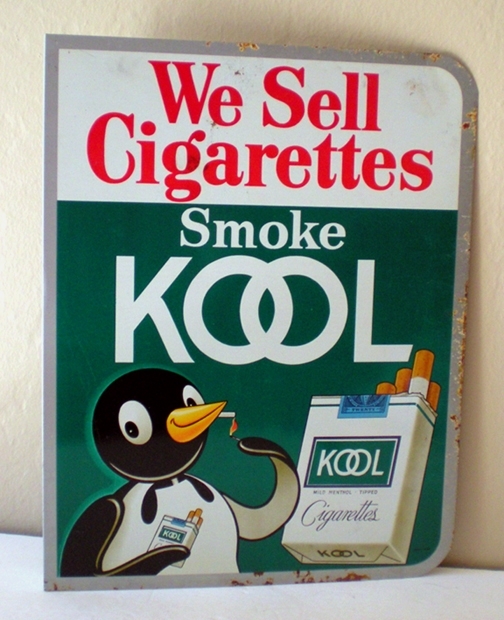 On the door was a sign decorated with a cartoon penguin cavorting on the ice: “Come on in, it’s Kool inside (air conditioned)!” The ad beckoning folks indoors was sponsored by Kool cigarettes. That was the smelly, smoky era of cigs, and similar ads were everywhere—on TV, billboards on buses. I was born into a family with several chain smokers, including both of my parents. In his heyday, Dad managed to puff 4 packs a day (that’s 80 butts, people). To accomplish this feat, he smoked from dawn till bedtime, often lighting the new cigarette from the old one. 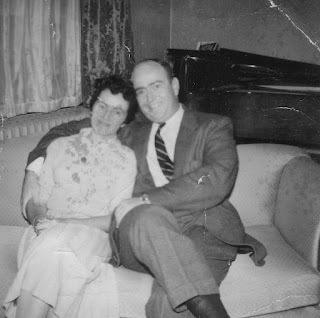 Mom was no slouch either (2 packs a day). Her beloved Pall Malls accompanied endless cups of tea, and endless telephone conversations with friends. The main household chore for my sisters and me was to empty brimming ashtrays every morning before school (ashes had to cool down overnight). It never occurred to anyone involved that this was a dangerous habit. When I realize that, from birth on, I was exposed to six packs of secondhand smoke daily, it is a miracle I am not hooked up to oxygen. Dad in fact did die from smoking, at age 67. He had a massive stroke one April morning, and when my Mom found him, he was sitting on the bed, cig in one hand and lighter in the other. Mom had quit 6 years before, cold turkey, after continuing to puff, even when diagnosed with emphysema. She was visiting us in Philly after Rosie’s birth and caught the flu. In the hospital, a pulmonary specialist finally scared her enough to stop, saying she wouldn’t otherwise live to see her new grandchild’s first birthday. That, thank God, did it, and gave Joanie 16 smokeless years with us. 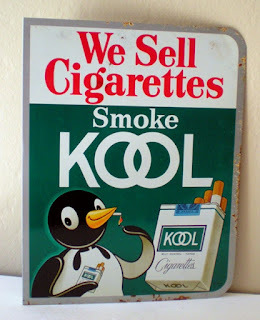 Unbelievably, I tried smoking briefly myself in my teens (nasty things called Virginia Slims), but didn’t get addicted. Given what we now know, I am saddened by the number of young people smoking still. We are, all of us, creatures of habit, and some of those habits are very bad. It’s human nature, and it’s a shame—especially a shame when teenagers have such a sense of invincibility, and are convinced nothing can hurt them. Though prices climb through the roof, Big Tobacco is demonized, and smokers are banned from lighting up indoors…there are still cigarettes, and still cigarette addicts. 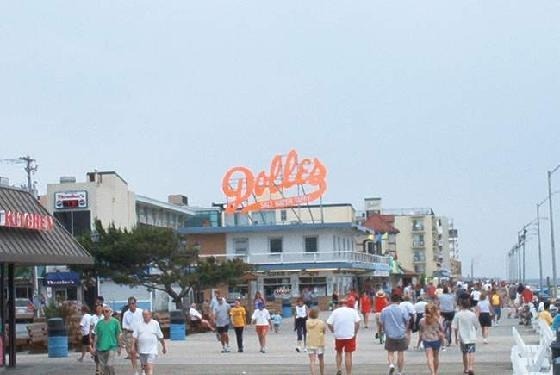 This summer, as I watch people on the boardwalk, wreathed in smoke, I say a little prayer. May I, may we, have the courage to change our own bad habits, whatever they may be. It’s never too late. When PJ was very little, he used to imitate one of his favorite Pokemon characters. 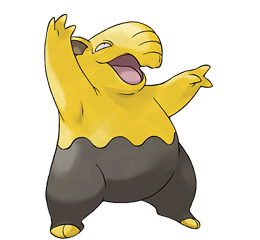 Arms outstretched, he would croon "drowzee" as if hypnotizing us all into sleepiness. We thought it was pretty darned adorable. Most of the time in those years, I was already plenty "drowzee" and was ready to snooze at the stretch of PJ's arm. Days that began feeding Julie @ 5 AM ended past 11 with one final tuck-in and kiss for whichever child was currently insomniac. Over the last decades, my sound sleep has been quite intermittent. I am often nocturnally tormented by a repertory company of horrible people doing horrendous things to the people I love. I swear, you could charge admission to my dreams and make quite a bundle! The past three weeks, restful slumbers have totally eluded me. 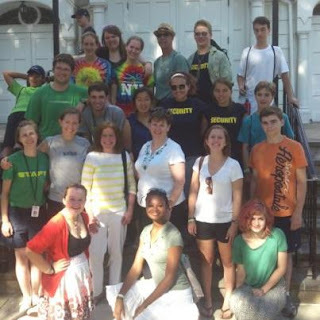 Through my fault, I scheduled Vacation Bible School and our mission trip to Queens, back-to-back. Naturally, my nighttime hours were spent dreading...any/all VBS mishaps, illnesses or injuries, and the plethora of Things That Can Go Wrong on a Mission Trip (from fender-benders to slacker kids to bizzarro chaperones from other churches). Sheridan and Ya-Jhu set their wedding date as June 23rd, a mere two days before the VBS/mission trip marathon. We eschewed caterers and florists and photographers, and opted for a totally DIY wedding. Add Chaotic Kitchen Kapers, wilted blooms and an album of blurred pics to my list of dreads. 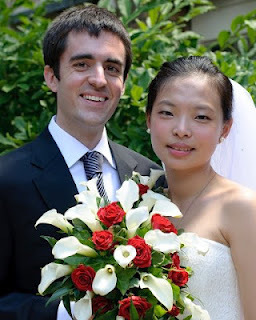 The wedding was lovely, a very personal ceremony with lots of new music and heartfelt sentiments in both English and Chinese. As for the food, Julie made a scrumptious wedding cake, and my appetizers were well received (I had low expectations and my motto--from Woody Allen's Don't Drink the Water--was "Be thankful nobody died.") The photos (thanks to sister C) are beautiful. Happy couple, check! "Operation Overboard" VBS was a big hit. We had one spill (a dramatic one, as a little girl catapulted head over counselor's head in a piggy-back ride incident), but she was fine. The children enjoyed the crafts and games and drama and songs. While I slept poorly that week, I awoke to five days of success. Happy little divers, check! July 1st was a scorcher, as was the week that followed. By the time we pulled our rental vans into the lot in Jamaica, Queens, we were officially exhausted. Yet God had a lengthy plan for us!! Monday through Thursday we served at Kids' Club, at a variety of area retirement homes, cleaning up Corona Park. 11 PM saw me snoozing on an air mattress in a sea of adolescent girls. By the time Friday arrived and we had our fun day in Manhattan, the thermometer read 103 degrees and once again I was quite, quite "drowzee." Our trek home at day's end was a march of endurance. But we surfaced safely at CLC. Happy missionaries, check! I am home now. I am very drowzee. Check. May God bless all the sleepers, everywhere.